The dream of standing tall at the top of the world is anybody's wish list. To dare, to dream and to realize the ultimate dream should be the ultimate priority of accomplished human being. The feeling of being the tallest person in the world and seeing the world dwarfed in front of you is the greatest adventure addiction. This reason may be the factor which pulled lots of aspiring climbers to cherish the moment. The tale of bravery, sacrifice and summit would be the proud tale to be shared for generations to come. Regardless of the unlimited stories of failure and tragedies, Mount Everest continues to lure the mountaineers to its womb. The expedition in the Everest would come as a double whammy as you have to be acclimatized via the trekking up to the Everest Base Camp. Come make your own story associated with the tallest natural landmark of the world. In between times, we rest and get used to the altitude without undue exertion, as experience has shown this is the best way to prepare. We aim to make base camp as comfortable as is reasonably possible, with a heated, triple-skin mess tent, individual tents for each climber to sleep in, broadband internet connection and satellite telephones. Unfortunately, the potential for espionage means I can't reveal all of our "secrets" here! Before venturing into the Khumbu Icefall, we will practise secure movement through complex ice terrain including the use of the ladders and fixed rope. We do this locally, in base camp and on the ice columns found at the lower edge of the icefall. As soon as the route through the Icefall is prepared and after the training in base camp, we will have our first go at the icefall, with the aim of getting halfway through and back in time for mid-morning in base camp. Then, we will progress higher until we know we can get through the icefall and all the way to Camp 1 in a reasonable time.Whilst we are getting accustomed to the ropes, ladders and altitude, the Sherpas will be running loads through the icefall, into the Western Cwm and beyond. The Khumbu Icefall, the highest ice-bouldering obstacle course in the world, deserves respect. The icefall is a jumbled morass of ice-blocks, ice towers, and centuries old ice, riven by crevasses, all moving inexorably downwards from the Western Cwm to the Khumbu Valley, below. It's dangerous, as the ice is constantly moving and ice towers can collapse without warning. It is not a place for the uninitiated, except in the company of experienced leaders and Sherpas, who have negotiated its labyrinth many times before. Even then, safety is far from absolute and speed is important, as is an intricate knowledge of the ways of the icefall that can only have been gained by many passages up and down. Although the exact route changes each year, and throughout the season as we move from hard winter to softer spring, it retains the same essential features and direction from bottom to top. Climbing in the icefall, or entering the Western Cwm in the heat of the day, is akin to being in a blast-furnace, so our rate of ascent slows a great deal after the sun rises. So whenever we do go through the icefall, we will do it as early as is practicable in the morning and aim to get to Camp 1 just as the sun reaches us. An early start from Camp 2 will see you crossing the upper Cwm to the base of Everest's most impressive wall, the Lhotse Face. Early in the season, when the face is still unfettered by human steps, this steep section makes for the most grueling and technically intricate day on the mountain. Gusting winds, snow plumes, and the sight of the steep face above greet you at the base of Lhotse after a steady morning walk to the very end of the Cwm, above Camp 2. Careful footwork will have you ascending this section confidently where the laser-straight ascent, which rises on a slope that seems to touch your nose is in stark contrast to the zigzag maze of the icefall below. Typically, our camp is pitched in the lower neighborhood of camp 3 (which can sprawl over several hundred metres up the slope) affording us better shelter from the wind than some of the tents perched above. And, after a night of re-hydration and an initial round of oxygen-rich sleep, it's a return to base camp and then all the way off the mountain to Dingboche before you return here just once more, on the way to the top. Next time, when we leave Camp 3 at 7,400 meters, you will be gripped by the first flush of true summit fever; down-suits donned, TopOut masks fitted, the first hiss of oxygen spreads from tent to tent as valves are cracked open. This marks the first day of climbing on "gas" and the first stage of your ascent into the "death zone". The view does not disappoint either. The Nuptse Wall forms one half of the crescent bowl surrounding us, and the West Shoulder of Everest the other. Down the valley, the towering peaks of Pumori and Lingtren, which stand with grand presence above base camp, now look like anonymous ridges in the vast sea of Himalayan Giants stretching as far away as the eye can see. The village of base camp is long out of sight and registers now only by crackling radio transmissions during early morning calls. The climb from camp 3 launches another adrenaline-pumping attack on your senses as you inch-up the steep Lhotse Face. Using an ascender on fixed line, you grind up, slowly and steadily. After a hard, enduring early morning, the effort is rewarded by a left-hand turn and a traverse across Lhotse toward the famous landmark of the Yellow Band. It's no small relief at this point, as you will have ascended some 1,200-m/3,700-ft from Camp 2. When you look down the sweep of the Lhotse Face, our tents will appear as tiny dots, like peppercorns scattered at your feet. A second section rears up and onto the rocky Geneva Spur adding exciting scrambling to the mix. The exhilaration of scrambling in such a sensational setting, combined with the apprehension of approaching 8,000-metres and the anxiety of catching your breath on top of the Spur, drawing heavily through the mask, needs first-hand experience to comprehend. Turning the corner here, you will be heading across the home stretch to our highest camp at the South Col on what seems to be flat ground. Now the fixed-line disappears briefly, which lends an enticing sense of freedom, even though the wind usually picks up speed here to whisper caution. The last few metres of walking to the South Col inevitably brings with it a whole flood of emotions, since you've made all but the very last leap en route to the highest point on earth. After a few moments of contemplation, it's down to business. Navigating to the relative shelter of our tents it is then an immediate dash to remove damp socks, arrange boots to dry, tying down crampons and ice axes outside, and diving into warm sleeping bags while setting to work on sparking up the stoves. South Col to Summit After an afternoon of drinking and eating, as well as attempts to sleep (thwarted by excitement and adrenalin), the summit push begins between 10 pm and midnight. Typically the howling winds which will accompany the team in the first hours of climbing die down as the night continues. At 27,700 feet we arrive at the small platform of snow known as the Balcony. Here, we change over oxygen bottles, steal a few minutes rest and make contact with Mara at base camp, who is on stand-by, maintaining a watchful vigil whilst we reach out for the top. The route then turns to a sustained 300-m/1,000-ft climb up the South-East Ridge towards the South Summit. The climbing remains similar to the earlier sections: step, pause, breathe, repeat. Across some rocky steps at the top of the ridge, we reach the South Summit and from here the view opens up to the Hilary Step and all the way up to the top. Depending on whether we have changed oxygen bottles at the Balcony, we may switch again here. Above the tangle of fixed lines on the 40 foot Hilary Step, it's about 100-m/330 vertical feet between here and the summit. But the sheer drop down the Kangshung Face on one side and the South West Face on the other makes this a section of breathtaking climbing both physically and emotionally hard. And the reward, of course, opens up at 8,848-m/29,028 feet where there's no higher step in the world. We hope to be on the summit in the early morning, with plenty of time to make the long descent to the South Col. Before starting out for the top, you will have agreed a turn-around time with David, who will ensure that should you not have reached the top by this time, you will go down to the relative safety of Camp 4. After spending another night sleeping with oxygen, the team will descend from camp 4, on the South Col, directly to camp 2 and then, the next day, to base camp. 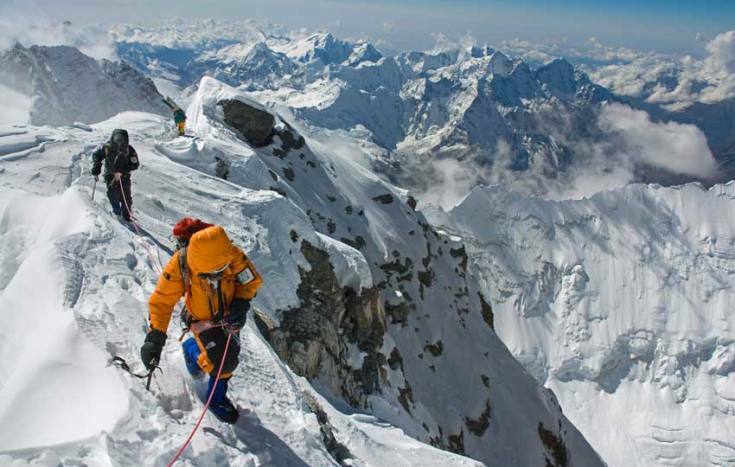 To join the Everest team you will need to have extensive mountaineering experience. This should include previous high altitude experience of at least 6,000 metres, mixed with a multitude of Alpine mountaineering and, preferably, you will have taken part in a previous 8,000-metre expedition. We have found that those who have been to an 8,000-metre peak previously have a considerably better chance of getting to the top of Everest. We would strongly advise you to climb one of the other 8,000 metre peaks before going to Everest, as this is the best way of ensuring the money you spend on Everest will be rewarded by a successful ascent and a safe return home. Exceptionally, however, climbers who have not had the chance of climbing an 8,000 metre peak may consider Everest if they have a compensating depth of experience, that might include many alternative expeditions such as Huascaran, Illimani, Denali, or Muztag Ata. We do not consider an ascent of Aconcagua, by itself, to be suitable preparation for Everest and would not accept a booking on this basis. Although fixed ropes will be used where appropriate, expedition members must have the ability to climb Alpine routes graded AD, or equivalent. All team members must be competent mountaineers and self-sufficient with the ability to move between and to live in high mountain camps un-aided or supervised. In the extreme, we will be looking for some assurance that climbers would be able to survive being storm-bound in a tent at 8,000 metres for as long as 5 days, without significant detriment to their health and well-being such that at the end of such a storm, they return safely. Welcome Nepal Treks and Tours are professionally-led teams of competent mountaineers who each have enough experience to climb the world's highest mountain, under the supervision and leadership of an accomplished and experienced high-altitude leader. Our Everest expeditions are not "guided" because this is not a realistic proposition in the high-altitude realm of 8,000 metres and above. "Guiding" and being "guided" implies the intimate supervision and care of a "client" by a "Guide" who can be responsible for the direct and immediate control of safety, as is normally and traditionally practised in the Alps. On Everest, such a direct duty-of-care, implicit in the traditional guide-client relationship, is not possible. Instead, Backpacker Treks & Expedition accepts team members that, with a combination of their past experience, balanced with a strong team around them and highly experienced leaders, they are empowered to reach the top of the world. This ensures you have the support that you need dependent on your own abilities. You can leverage your current experience and how you feel on the mountain, with the independence to move between camps and optimise your schedule on a day-by-day basis. And when you need additional support and advice, Leaders and Sherpas are there to assist and advise you on your ascent. Flight to Lukla Airport from Katmandu, & back after expedition. Porters/Yaks to carry equipments and food all the way to BC & back. Cook & kitchen boys at BC. POISK Oxygen (08 bottles per client & 06 per Sherpa). Mask & regulator mask set ( must be return after the Expedition). Highly preferable meals at BC with complete hot drink & normal beverages. Exported High altitude food for higher camps (ready to eat food). Best quality Tents at BC single or twin sharing as per the client desire. Best quality Dinning tent with enough no of teble & chairs, plus inside the tent, we will set Gas Heaters to make the Dinning hall enough warm. Complete carpeting inside the dinning tent. Comfortable & portable wooden toilet at the base camp. A nice portable wooden shower room with hot water at the base camp. High quality high altitude tents for above BC use. Necessary climbing hardware gears with fixed ropes. Enough EPI (high altitude) gases with burners for higher camps use. Oxygen with regulator set for medical purpose. Radio walkie-talkie set to each client with base station & permit cost. Satellite phone for emergency purpose ($ 4 chargeable for personal call). Generator/solar panel with accessories for recharging & power supply purpose. Gammov bag for medical purpose. Insurance of all local team members. Day tour program around KTM. Expedition blessing Puja arrangement at Katmandu and Base camp. Last but most important COMPLETE SET UP INTERM/MIDDLE CAMP with sleeping bags, sleeping mattress, food & drinking stuff & cooking crew. Day 02One and Half hour drive to Nagarkot. Accommodation in luxury tents for acclimatization. Day 03Early morning sunrise view of the mountains. Visit some highest points to observe kathmandu Valley & overnight at camp. Day 04Fly to Lukla Airport(2,800m) and trek begins for Phakding(2640m). Overnight at camp. Day 05Trek to Namche Bazar(3,446m). Overnight at camp. Day 06Trek to Khumjung(3790m). Overnight at camp. Day 08Trek to Dingboche. (4300) Overnight at camp. Day 09Trek to Lobuche(4900m) Overnight at camp. Day 10Trek to GorakShep(5,200m) Overnight at camp. Day 11Trek to Everest Base Camp and back to GorakShep. Overnight at camp. Day 12Day 12 to Day 55 Climbing Period Mt. Everest. Overnight at camp. Day 56Cleaning up Base Camp. Overnight at camp. Day 57Trek to Pheriche(4280m). Overnight at camp. Day 58Trek Back to Khumjung. Overnight at camp. Day 59Trek back to Manjo. Overnight at camp. Day 60Trek back to Lukla. Overnight at camp. Day 61Fly back to Kathmandu. Transfer to Hotel.